Confidence is high and risk-taking is on the rise, and that is something to worry about. It's not because equity prices are soaring and therefore downside bubble-popping risks are greater. It's because more confidence and a greater willingness to take on risk mean that the demand for money is declining, but the Fed—at least for now—is reluctant to move aggressively to offset the decline in money demand by boosting short-term rates and draining excess reserves. As Milton Friedman taught us years ago, inflation is a monetary phenomenon which results from an excess of money relative to the demand for it. 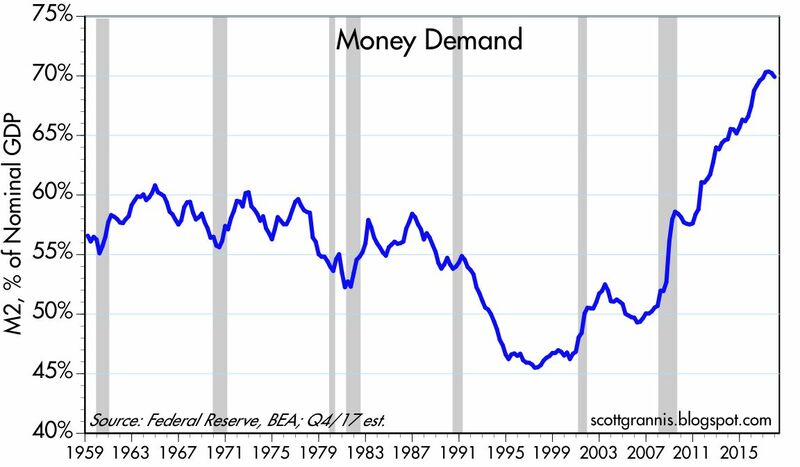 Today we have declining money demand at a time when the supply of money remains abundant (e.g., $2 trillion of excess bank reserves) and interest rates remain very low. 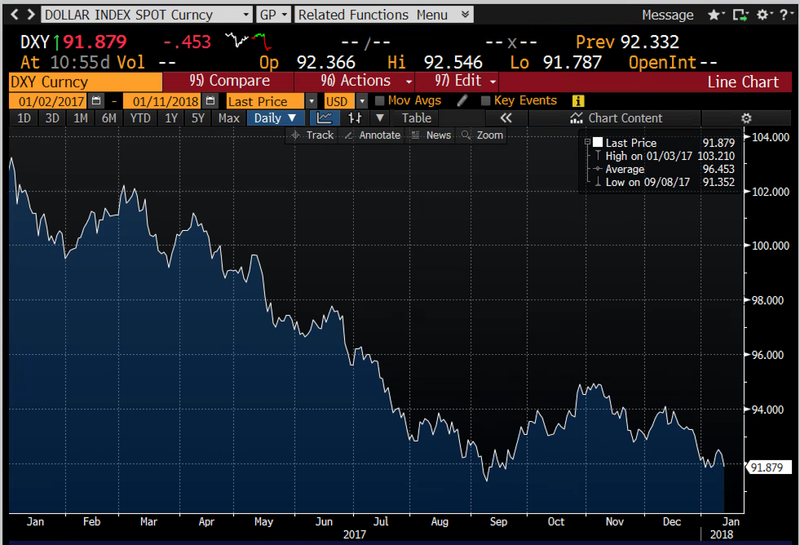 It's likely that because of this we are seeing the early signs of rising inflation in the form of higher prices for sensitive assets such as gold and commodities, and a decline in the value of the dollar. 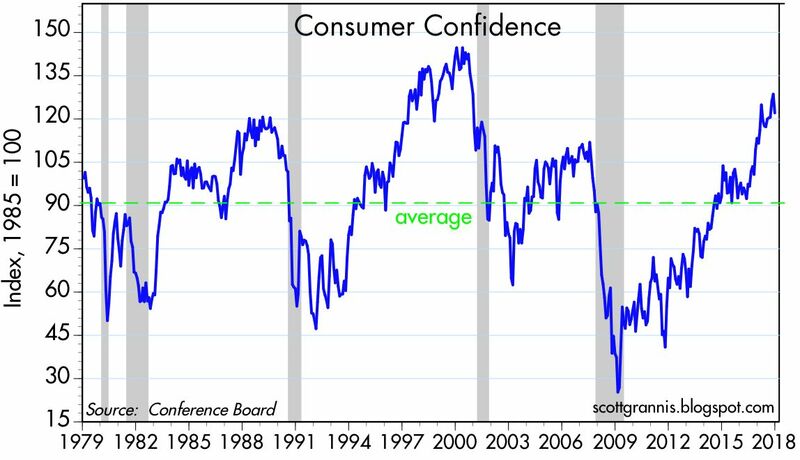 Here's what we know so far: The boost to confidence began just over a year ago, coincident with the surprise election of Donald Trump, who promised to take radical measures to boost the economy by cutting tax and regulatory burdens. 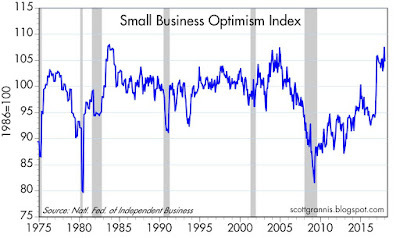 Confidence at both the consumer and small business levels promptly surged. The growth of bank savings accounts began to slow, the dollar began to decline, and gold began to rise—all such changes being symptomatic of declining money demand and the rational result of rising confidence. Now, in the past month or so, inflation expectations as embodied in TIPS and Treasury prices have risen from about 1.8% to 2.0%. None of this is as yet scary or off the charts, but it is worrisome. It's not too late for the Fed to step up the pace of its rate hikes and reserve draining operations, but since the market is not expecting this to happen, the reality of an unexpected rise in interest rates would be at the very least a headwind for the equity market and/or fodder for selloffs and consolidations. And if the Fed doesn't react with faster rate hikes and more reserve draining, then inflation could become embedded and difficult to tame—and before too long we'd be worried about another recession. I'm not saying we're on the cusp of disaster. What I'm saying is that we now have accumulating evidence and reason to be concerned about the risk of rising inflation and higher interest rates. It's great news that the economy is doing better and tax reform has passed; there is every reason to believe that the economy is headed for at least several years of much stronger growth. But the coast is not completely clear. In a best-case scenario, I'd like to see the bond market signal the Fed that higher rates are warranted. The collective wisdom of the bond market is arguably better than that of a handful of Fed governors. 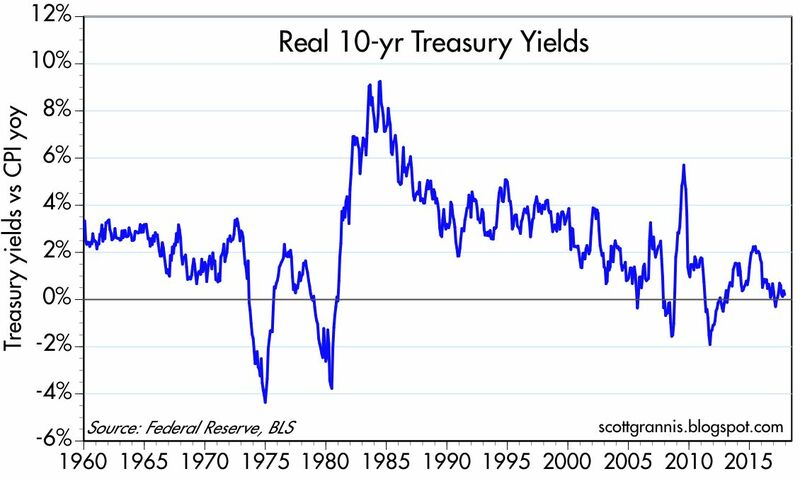 One key thing to watch for is higher real yields, since that would be an indication that the market is pricing in stronger growth, and stronger growth and higher nominal and real yields go happily hand-in-hand. 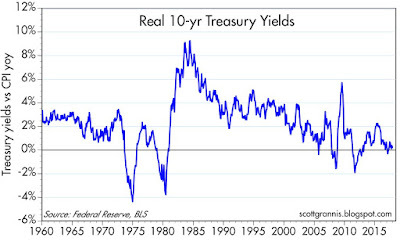 So far, however, real yields remain quite subdued. To date, the move to higher yields is concentrated in the nominal space, and that means that rising inflation expectations—not stronger growth—are what's driving yields higher. 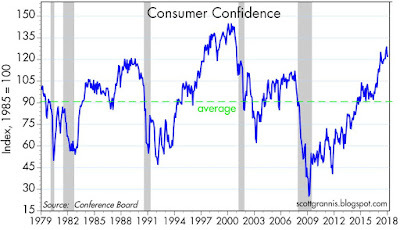 As Chart #2 shows, consumer confidence began rising to healthy levels a few years ago. It's not yet at extremely high levels, but it is significantly better now that it was during most of the recovery years. Charts #3 and #4 are the most important of all the charts in this post. 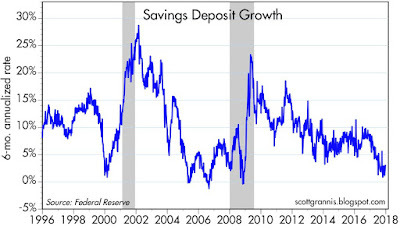 What they show is a significant reduction in the growth of bank savings deposits in recent years. The slowdown accelerated in the past year, as growth rates fell from 8% in late 2016 to 3% in late 2017. Savings accounts in the current business cycle have been excellent indicators of money demand because they have paid extremely low rates of interest; no one has put money in a savings account in order to get huge interest rate rewards. What they are looking for is safety and liquidity. 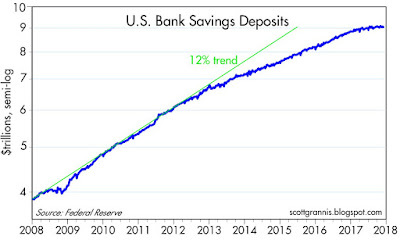 Yet despite paying almost nothing, bank savings account more than doubled in the past 9 years. This can only be because people had an overwhelming desire to keep their money safe while they increased their holdings of money. 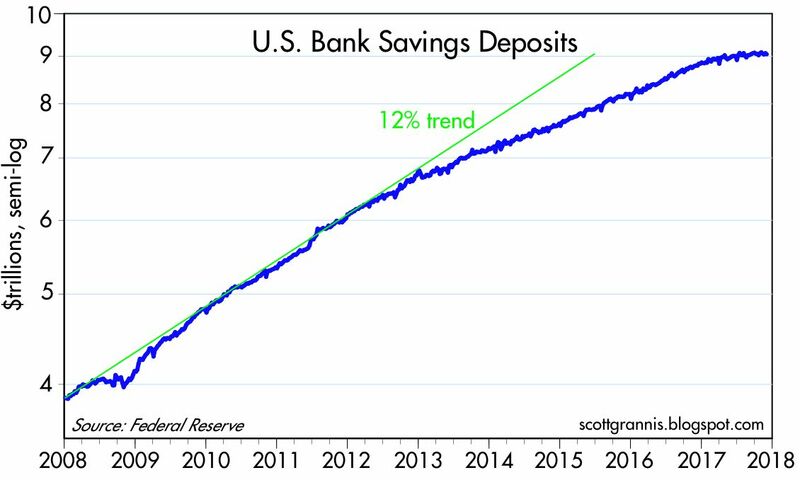 But now, people are becoming less and less risk averse, and the demand for cash and cash equivalents (like savings accounts) is declining in favor of increased demand for equities and other risky assets. With more confidence comes less desire for safety and a greater desire to take on risk. Chart #5 shows how the public's desire to hold on to money increased dramatically beginning in the Great Recession. Think of M2 as a proxy for the amount of cash and cash equivalents the average person wants to hold, and nominal GDP as a proxy for the average person's annual income. 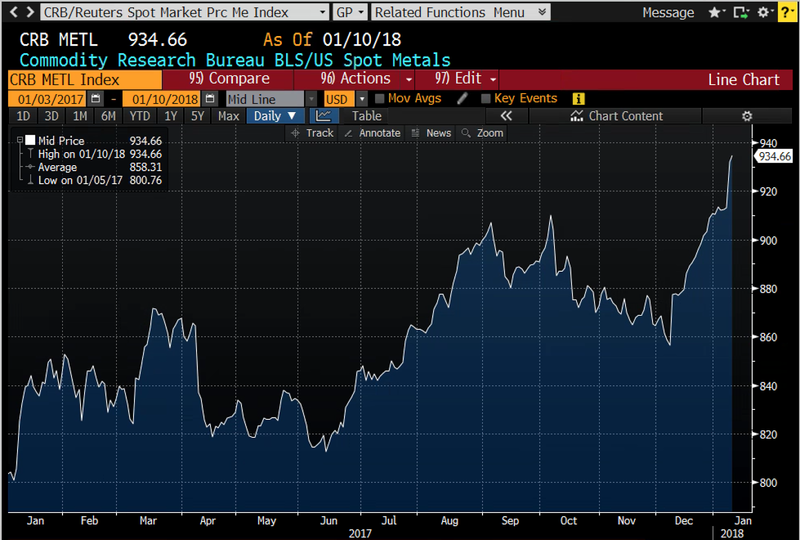 The ratio of M2 to GDP peaked about six months ago, after reaching an all-time high, because there was a huge move on the part of the public to boost their stores of safe cash and cash equivalents. Since it's apparent that the public wants to shed some of its cash holdings, the only way that can happen is if there is a faster increase in nominal and real GDP. The extra amount of money that could be shed could translate into trillions of dollars of additional real and nominal GDP. 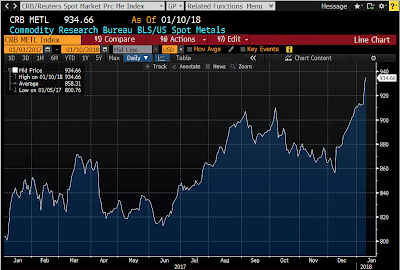 Chart #6 shows an index of industrial metals prices, which have increased by almost 17% since the beginning of 2017. 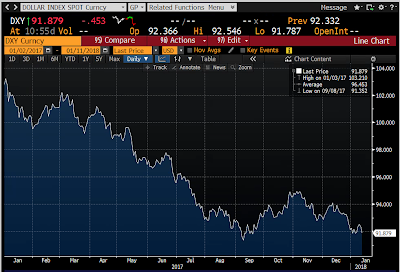 This undoubtedly has a lot to do with improving global growth fundamentals, as well as the decline in the value of the dollar, shown in Chart #7 (the dollar has dropped over 10% since early last year vis a vis other major currencies). Chart #8 shows the evolution over the past year of inflation expectations for the next 5 years. 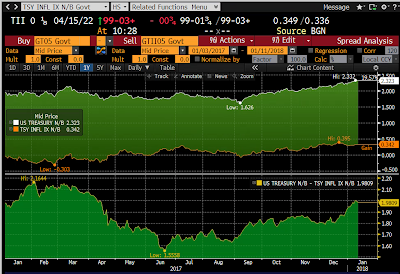 The top portion of the chart shows nominal yields for 5-yr Treasuries and the real yield on 5-yr TIPS. The difference between the two—the market's expected average annual rate of inflation over the next 5 years—is shown on the bottom panel. Note that current inflation expectations are about 2%, which is modestly higher than the 1.6% average rate of CPI inflation over the past 10 years and modestly lower than the 2.15% average over the past 20 years. Current expectations are not out of line with the past, but they are near the high end of past trends. 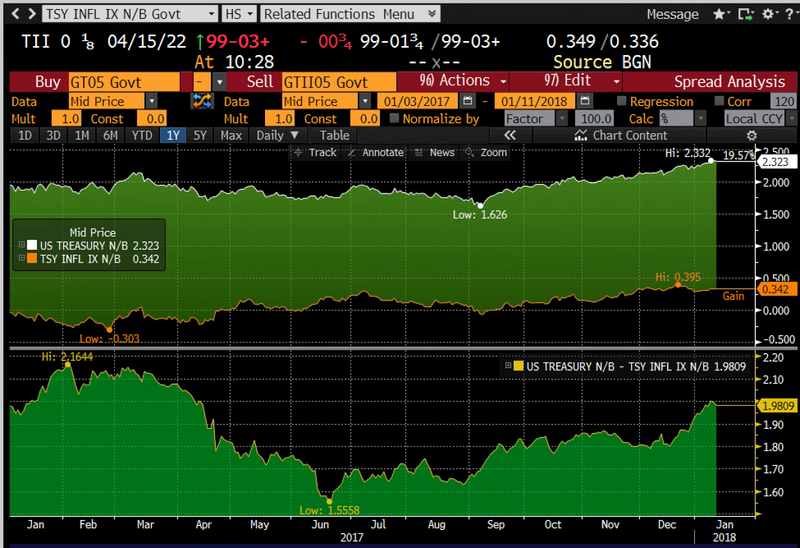 Chart #9 shows the same analysis for 10-yr Treasuries and 10-yr TIPS. Note also that over the past month or so, real yields have been relatively flat, while nominal yields have risen: that is what happens when the market expects inflation to rise but economic growth to remain modest. 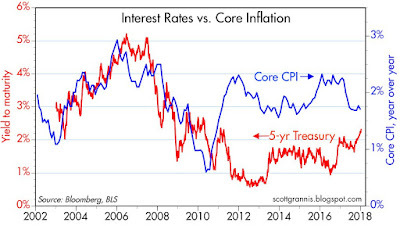 Chart #10 compares the year over year rate of core CPI inflation and the 5-yr Treasury yield. 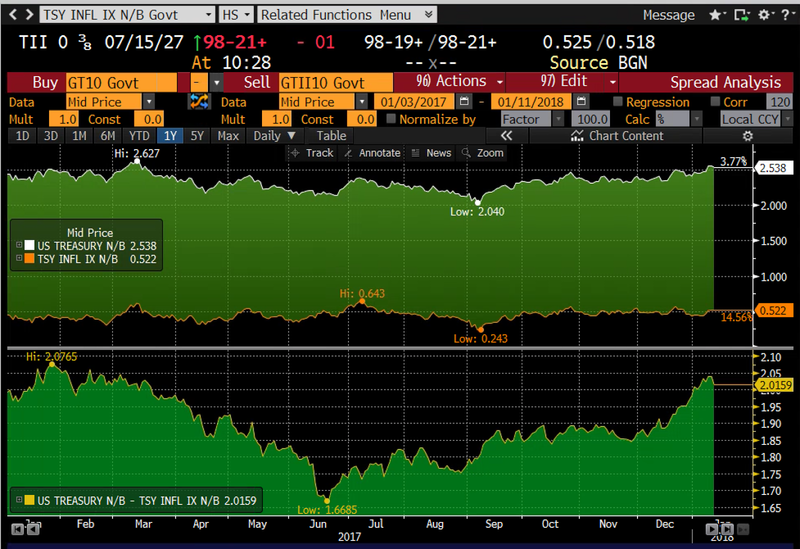 It suggests that if future inflation averages 2%, as the bond market currently expects, then we might expect the 5-yr Treasury yield to rise from their current level of 2.3% to about 3.5% (with 5-yr real yields on TIPS moving up from their current 0.3% to 1.5%). Those moves are significantly higher than what the bond market is currently expecting. Put another way, the current level of Treasury yields is still unusually low given a 2% inflation world. 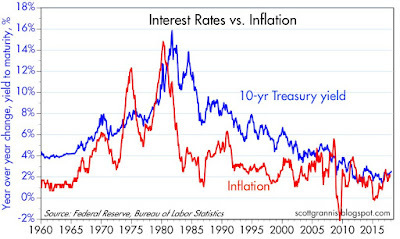 Charts #11 and #12 give you historical context for the relationship between 10-yr Treasury yields and inflation. More often than not, 10-yr yields trade at least 1-2 percentage points higher than the annual rate of inflation. 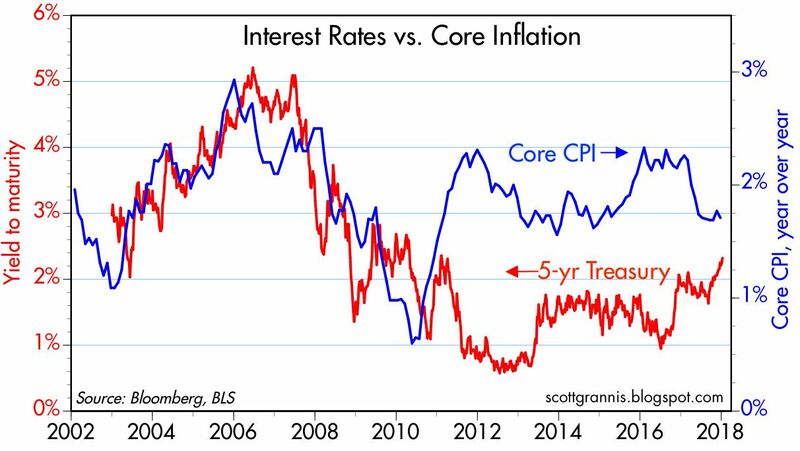 Currently, 10-yr Treasury yields are about 2.5%, whereas the current trend of CPI inflation is about 2%. Were things to get back to "normal," in a 2% inflation world we might therefore expect to see 10-yr yields at 3.5% to 4%. 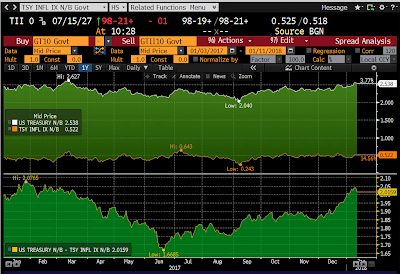 So there is plenty of justification for yields to move higher by much more than the market expects. The only thing keeping yields from rising significantly is the market's belief (as evidenced by 5-yr real yields of only 0.3%) that the economy is still stuck in a "new normal" rut; that due to capacity constraints and demographics, it would be very difficult for the economy to grow by much more than 2% per year for the foreseeable future. This year will prove whether the "new normal" view will prevail, or whether significant tax and regulatory reform will unleash a new wave of growth. My money is on faster growth and higher interest rates. Faster growth will be very welcome, but higher interest rates will hurt, and they could very well keep future equity gains at modest levels (by putting downward pressure on PE ratios) even as the economy improves. So even though the economy looks set to surprise on the upside, it doesn't necessarily follow that equity valuation will also surprise on the upside. You some very good points, but the recent “tax reform” also limits the deductibility of property tax and state income tax, disproportionately impacting States that are responsible for a large part of US economic engine. I hope it will be repealed in the next Congress. Rich: You overlook some important principles. One: The ideal tax system has no deductions at all, because that allows marginal tax rates to be as low as possible. Deductions distort economic activity and must be paid for by higher marginal tax rates on those not favored by deductions. Two: high-tax states such as California can quite easily avoid the "problem" you complain about by lowering their top marginal rates to be more competitive with other states. I hope that Congress repeals the $10,000 cap on SALT deductions, and in exchange lowers top marginal tax rates for everyone. Lower marginal rates are what strengthens the US economic engine the most, not preserving high marginal rates in some states rather than others. Great post, love the numbered charts. Not much talked about, but President Trump will just about re-make the FOMC this year--many vacancies. Okay so we know large federal budget deficits are baked into the cake. And we know Trump will remake the FOMC. This is the most impressive and excellent analysis ever. It really is the best that I've seen (so far). Suspect that you are largely correct and that we are about to see some huge changes and not just this year, but for several to come. 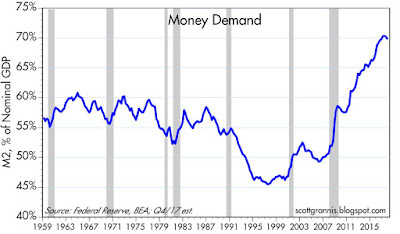 Chart #5 in particular: Money Demand M2 as a % of Nominal GDP is the real eye opener for myself. It looks as though the old normal was between 55-60%. While we briefly flirted with 70%, it looks as if there is a lot of room to go before we get back to anything near the old normal. I also have to wonder if our society could ever navigate a smooth landing back in the old normal range. Yikes! That leads me to consider that it is possible that the economy might even need to over correct to something below 50% of M2 to GDP. Hopefully not. We cannot have systemic CPI inflation without wage inflation and we are already seeing signs of it. Many corporations have announced pay raises because of tax reform. I love it. This massive "tax cut for the rich" has already started trickling down to the lunch bucket crowd. That's great. But we need to see improved productivity along with it or we will have wage inflation that beefs up CPI and the Fed will kill the benefits we can all reap from this tax reform. Let's hope that does not happen. Thank you, Scott, for your labor in this vineyard of a dismal science. You are indeed worthy of honor. And along with Benj, I thank you for numbering your excellent charts. This economy looks to me like it is laying a golden egg that will benefit us all. My biggest worry is the FED. That is my #1 concern, day and night. - High stock valuations continue. of cash, in their portfolios. Ratio is the highest ever. after a 24-year bull market. and we'll see who was right ! Jeez Cliff. You are a depressing guy. No big deal what happens in between. Re:capacity constrains in labour space. Here in EU, the same story builds up. Anecdotally, Polands last labour pool, i.e. emmigrants from Ukraine,has recently dried up. German construction sector suffers lack of workforce too. So, the point is that it will be easier to rise salaries in US that one can expect, as others do the same. US has also other vital advantage, it can become a digital economy, faster then others, due to vast intellectual resources. There are private companies using Artificial Inteligence, already implementing this solutions even to steel mills. Re constraints on the supply of labor. It's all about incentives. Since the end of 2007 (just before the Great Recession), the US economy has created 9 million new jobs. That represents a meager 6.5% expansion of the workforce in the span of 10 years. Yes, it's been a miserably slow and weak recovery. But in that same period, the labor force participation rate (the number of people eligible to work who work or who want to work) has fallen from 66% to 63%; about 4.8 million people have decided to "drop out" of the labor force. Undoubtedly some of those have retired early or have taken disability, etc. If half of them were given the proper incentives (e.g., lower tax rates, higher real incomes) they might decided to look for work. That means there are potentially 2.4 million people sitting on the sidelines who could return to the labor force, and I'd bet that most of them are skilled. The unemployment rate is quite low, but that doesn't mean the economy is running at full capacity. On the contrary, there is plenty of upside potential if the incentives are right. The Cliff Claven of Finance offers some interesting data which I take based on his closing comment is presumed to be contrary to the presentation from Scott Grannis. I'm not so sure. First the TD Ameritrade Investor Movement Index only goes back to 2010 and does not yet demonstrate any forecasting value. Granted, the Cliff's conclusion is right. TD Ameritrade retail customers are the most optimistic they have been since 2009. During the first year of each of the Republican presidencies there was a significant, double digit decline in the S&P 500 but they were all in the first year. We are approaching the end of a current Republican presidency first year. Unless we get a collapse within the next week, this historic string will be broken. The S&P 500 weekly RSI has shown no predictive value since 1993. It has entered the "overbought" territory many times without a subsequent drop in price. The S&P 500 and Corporate Median comparisons he makes are all backward looking and do not in any way look to the future. Investors invest in stocks for future rewards, not past ones. However, these can serve as caution signs, but they do not necessarily predict a collapse either in the economy or the US stock market. The biggest worry to me is the Federal Reserve but the FOMC has not yet crossed the line to squeeze the money supply and choke the recovery. That the FED will do this is a serious risk but probably not over the next 12 months. In that regard, however, stay tuned and stay alert. Stocks are not priced for high returns, but that was true even one year ago. No doubt about it, valuations are high. 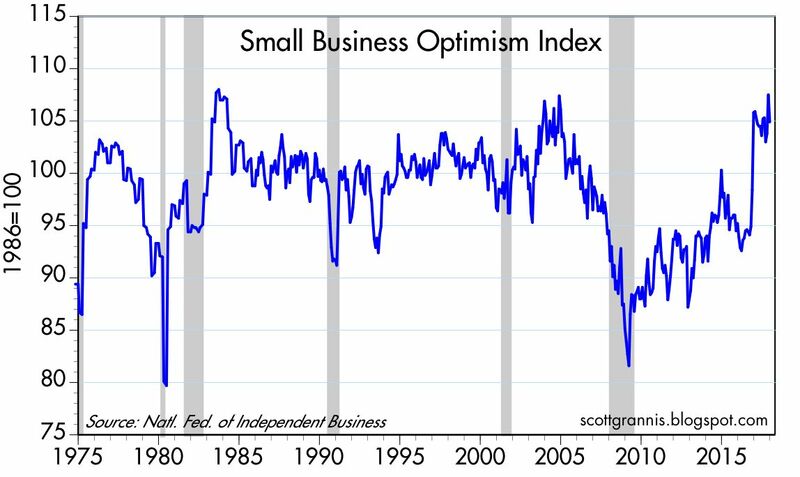 Investor sentiment is on the verge of exuberance. I think it still makes sense at this point to invest in stocks, but it also will pay to be cautious and to be prepared to exit in case something really goes wrong, especially with the FOMC. I can't predict where anything will be in a year. Neither can anyone else. But I do hope we can all come back in a year having enjoyed the benefits of a surging economy that lifts all boats. No one can predict the market. Never seen it in 35 yrs in the business. Problem is you need to be right repeatedly. Anyone who believes they can is delusional. That said, over time stocks go up. Fading this trend is stupid. Simple as that. One further point; listening to bears like Cliff (or God forbid John Hussman) not only puts you in a spot to waste $ attempting to time the market, you will also pay more tax. It is the height of arrogance to believe you have some model that can beat buy/hold. Sounds cool, though. Lordy, the comments section is mind blowing. Seems to me the economy is just starting up. Lots and lots of pent up demand that could last for as many years as we've been throttled. Americans got tired of losing during the previous 8 years with weak growth. Productive people are ready to win for a while. Gosh...we may even hit 3% growth! Look at all the disposable income vs financial obligations! Apple's announced $38 BILLION tax payment from repatriated funds is more than the entire bottom 50% of Americans paid in federal income tax in 2014. Read that again. This action was directly from the tax rate cuts. Every DEMOCRAT voted against this. "How will Trump pay for his irresponsible tax cuts?? Corporate giveaway!!! TAX CUTS FOR THE RICH!!!" So much for the claim that falling revenues would increase the deficit. Only government spending will increase the deficit. Revenue is going to soar as profits and paychecks increase. Dozens of US corps have raised their minimum wages and paid out unexpected bonuses, citing the tax bill. Every DEMOCRAT voted against this. African American unemployment, after rising during the Obama RECOVERY, has now fallen to the lowest rate ever recorded in US history. Every DEMOCRAT voted against this. Markets have a lot of making up to do, to get back to trend. No, it wont be straight up...but it will be up. If America gets tired of winning so much, and PUBs lose their advantage in the House or Senate, then sell the hell out of your stocks...just like always. The future is bright for everybody but politicians as long as MAGA stays on track. If Trump secures the border and gets control of immigration, stocks will go up for a long, long time. Hoover, Eisenhower, Nixon and Bush didn't have any of the Pro-America, Pro-Business policies of Donald Trump. Markets are loving Trump even better than Reagan. Trump is the first businessman ever elected POTUS. FYI, I know lots of people who beat hell out of buy and hold over the past 30 years, and Im one of them. Relative Strength works, and yes its cool. Trump Train is rolling! Opportunity is expanding for all. Make America Great Again! Yes, Im excited. There's a lot to be excited about these days! This is how its supposed to feel in America. Looking great work dear. I really appreciated to you on this quality work. Nice post!! this tips may help me for the future.